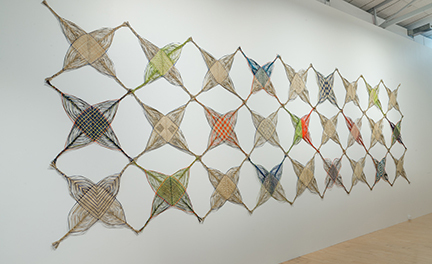 Three wonderfully woven installations by multimedia installation artist, academic and weaver, Maureen Lander is to grace the walls of the Sarjeant Gallery. In Flat-Pack Whakapapa, Ms Lander explores the connections between whakapapa and raranga (Māori weaving). Ms Lander will install Flat-Pack Whakapapa at the Gallery on 24 and 25 May and will be present for the Floor Talk on Saturday 26 May at 10.30am. In the installations she brings together traditional and contemporary concepts of kinship, family and friendship networks as well as genetic heritage and linkages. She expresses her ideas about human connection from a mātauranga Māori (Māori knowledge) perspective, using the language and symbolism of weaving and weaving techniques such as whiri (braiding) and whakairo (patterning)—and the concept of aho tuku iho (ancestral lines handed down continuously from generation to generation). “My work relates to place and ideas and I use those materials to articulate an idea. I’ve always been interested in my own whakapapa, and also, moving around, I’ve realised that whanau might be different in different places. People build up little whanau groups and that are ‘interest’ rather than ‘family’ based and that might be a contemporary idea of what whanaungatanga might be’ she says. Whakapapa, like DNA is always with whanau even when they travel and move away from their tūrangawaewae (the place they belong to through their whakapapa), hapū and iwi into the wider world. Ms Lander said weaving with flax suits her practice. “I grow it and have it on hand all the time. Over the years I have created a symbolic language with it. It’s an incredibly versatile plant and I can push it in all sorts of ways.” One of her installations resembles long strands of DNA,something the flax lends itself to quite naturally.